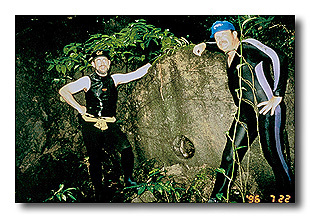 During my visit to Palau in July 1996, a chain of events led to yet another discovery, one which was totally unexpected: Chip Lambert and I found an archeological site containing tons of money. The story goes like this: A team of us had flown to Palau to photo-document a number of sites I had previously uncovered and to follow up on some new leads. One sunny day, we were diving off southwestern Babeldaob when two Palauan fishermen came alongside in their homemade canoe. Our guide, speaking in Palauan, explained what we were doing, as we were nowhere near the usual tourist dive areas. They then pointed to a nearby island, saying that a plane had crashed near a marine lake (salt water fed) on the interior of the island and that we could not miss it. Chip Lambert and I immediately swam to the island. After scaling a limestone cliff, we looked down the inner side and saw the small lake surrounded by steep limestone walls covered with tropical flora. Climbing down through the dense primordial vegetation, we snorkeled slowly across the shallow lake but found no plane (or salt-water crocodiles which are said to inhabit these lakes). When we got to the other side, we found a second, even more beautiful marine lake with steeper, more jungle-laden walls. But with no plane, we turned around. Hacking our way back from the second lake, Chip suddenly stopped and called to me. He was standing in front of a seven foot wheel of money - crystalline limestone money, that is, highly prized by the people of Yap in times past. Propped up into a vertical position, the money, green with mould, had been abandoned for a long time. A look at our topographic map that night showed that the marine lakes were not even recorded. The next day we returned with our crew and the subsequent search revealed an extensive mining operation. My daughter Nell found a large limestone wheel in the progress of being carved out of a wall. We also found a few bones of a child along with some shell jewelry in a tiny cleft deep inside a bat-laden cave. Suspecting this may be an untouched and old (by our standards, anyway) archeological find, we left everything intact. After photographing the site (just before all the electronic cameras shorted out during a torrential rainstorm), we notified Palauan authorities. We have not yet been able to determine if this site has been previously described archeologically and believe it is a new find. Lacking crystalline limestone on Yap, Yapese risked their lives, traveling hundreds of miles by canoe from Yap to Palau to bring back these huge stone wheels. Nestled as this money was in such a-hard-to-get-to spot, this must have been a very secret operation. It remains a mystery. There also remain reasons why a Corsair still may lie hidden on that island. Currently, I continue to look for several American planes known to have vanished over Palau that may still have aviators/crew members on board. As my archival review increases along with an increasing number of interviews, the number of crash sites I have begun to investigate is also increasing - along with the complexities of the field searches. During my last trip to Palau in June 1999, our team found two Corsairs, one TBF Avenger, one Japanese Jake seaplane and, incidentally, two small Japanese boats sunk during that time. Every plane found on that trip resulted from interviewing local Palauans willing to help. Archival records are proving most useful in identifying wrecks and crewmembers but are less useful in locating crash sites. The US Army Air Corps, Navy and the Marines left these warriors and their planes behind only with great reluctance and only after extensive searches following the war. Unfortunately, such searches were not always successful, and as a result, much remains to do in this historical backwater of World War II. That Palau, as a historical World War II battle site, has been essentially forgotten, contrasts with the Palau that thousands of SCUBA divers flock to every year to view some of the world's best underwater scenery. This contrast has pointedly reminded me that not all who died in combat died on the biggest and most famous battlefields. But they died no less bravely and they should not be forgotten any sooner. Perhaps filling in a little part of history here will help remind us all of this.